Hello dear followers, I hope all is well in your world wherever you happen to be. I am glad to report that my man-flu has subsided only to be replaced by a tooth abscess. I've had a couple of off days with it as you can imagine, but now the antibiotics have kicked all is much better. I came across this report from the BBC about how the Environment Agency are planning to use a fish poison called rotenone to remove a non-native species of fish called Asian Topmouth Gudgeon (Pseudorasbora parva) which has thought to have been introduced to our ecosystems by either the aquaria trade or by deliberate use as a fish bait according to RAFTS. Now there is a very good reason for wanting to eradicate this new invasive species. It has a very rapid breeding rate up to 4x faster than our native species, which could have a massive impact on our native fish. This would lead to the natives being out competed for food leading to a reduction in native fish populations. It also severely impacts on native populations by predating on native fish eggs. It is also a carrier of a parasite that affects carp and salmon. So, as you can see, this invasive species could devastate native fish stocks across the UK. A bit like what the Harlequin Ladybird (Harmonia adryxis) has done to our native ladybirds. However, and this is a big however, the poison that they are going to be using on the river will not only kill the non-natives, IT WILL KILL ALL THE FISH IN THE RIVER, including our native species such as eels, roach, minnow, stone loach. Even though the poison is a piscicide, which means that it will only affect fish. No other organism will be affected, including any that may feed upon the dead fish apparently. However, this will create a huge impact upon the ecosystem on that stretch of river as a major factor has been removed from it, meaning that all of a sudden there will be an influx of other organisms that the fish used to feed on. With that part of the food chain missing, the balance becomes unstable. So lets look at this food chain to see why it could become unbalanced. 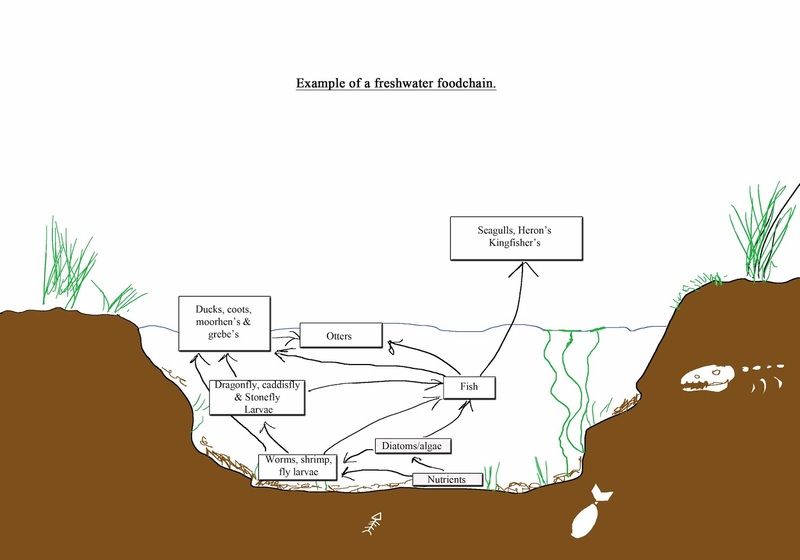 The food chain always begins at the very bottom where the detritus (dead vegetation, dead organisms, etc) build up and where the diatoms/algae feed from the nitrates and nitrogen's that leach into a water system from the surrounding land and also the detritus of rotting leaves and dying organisms in the silt on the riverbed. In turn, this is food for other organisms such as worms like bloodworm (mosquito larvae), freshwater shrimp and mayfly larvae. Again, these are eaten by small fish fry, dragonfly and caddisfly larvae who get eaten by bigger fish which end up getting eaten by birds such as herons, kingfishers, etc. I’ve knocked up a diagram below to try and simplify things a bit. Not easy with such a complicated system. A much simplified version of a very complicated food chain interrelationship. All this works seamlessly and has done so for millennia, but now we remove the fish from the equation and things start to get messy. Suddenly, there are no fish to eat the mosquito, mayfly, dragonfly larva or the freshwater shrimp and suddenly populations start to get out of control because the main regulator, the fish, have disappeared from the system. So come the warmer weather and suddenly there is a greater influx of mosquitos and mayfly emerging from the water due to lack of predation. There are more dragonflies on the wing which love to chase and eat other flying insects and it would be fair to think that the dragonflies will have plenty of food with all the mosquitos and mayfly about. However, the mosquitos and mayfly have much shorter lifespans than the longer lived dragonfly and soon the dragonflies will need to search elsewhere for food causing impacts on other ecosystems and food chains and species and this is only a very small part of the whole complicated system. I won’t lie, when I first saw this report, I was shocked, appalled even. I immediately took to contacting the Environment Agency for more information. I even tweeted to them asking could they not remove the non-natives first, then replace them afterwards. In fairness, they tweeted straight back to say that the fry of the gudgeon were as small as an eyelash and could possibly be found in the gills of native fish. This would mean that even if they did remove the natives first, they could re-introduce the non-natives when they put the natives back. A waste of time and effort. However, I was still shocked by such drastic action I began preparing my blog whilst awaiting for the information to come in. As I did so, I soon began to realise that what the EA were doing wasn’t such a bad thing after all, when you consider the much bigger picture. A new non-native species could and would take hold quickly and as they did so would also spread rapidly causing much more devastation to our native wildlife than the EA would do in a relatively very small operation. They have even said that they would restock the waterway with new, safe livestock. Then, the following morning, the EA emailed me a 6 page PDF which was very informative and explained so much more than the original BBC report. I’m not going to reproduce the whole PDF here as it does take some reading, but I will list the important bits that news agencies seem to miss and give you a more detailed version copied direct from the PDF. This is one of only 34 topmouth gudgeon populations in the wild across the UK, with populations being concentrated in the South East. We have already eradicated 14 of the 34 populations . Topmouth gudgeon are considered one of the most potentially damaging non-native fish species in Western Europe and are banned from sale in England and Wales. They harm the environment, fisheries and angling quality where they are present. If they escape or are intentionally introduced into the wild they have the potential to harm our native wildlife, habitats and fisheries. They reproduce rapidly, spawning up to 4 times per year. They eat the eggs and larvae of native fish. The male guards the eggs from other predators. They out compete native fish for food and habitat. They are very small and are easily accidentally transferred with movements of native fish. There is evidence that they may carry the threat of new diseases and parasites that could affect our native species. Is the method of removal humane? Yes – the dose applied will ensure that the fish are removed rapidly with minimum stress. Why can’t native fish be removed first? The lake near Crews Hill is very shallow which means we won't be able to use boats to remove native fish. The lake is also very silty, which makes it unsafe to remove them by wading into the lake. There are not a high number of native fish in the lake. The native fish in the stream are primarily roach, and we do not believe they would survive the necessary quarantine processes if we were able to remove them. If we were to remove the native fish from the stream before applying the rotenone, we would only be able to remove fish over 15cm to avoid confusion with non- native fish. We would need to hold the removed fish in quarantine before we could return them to the water. The quarantine process requires that each fish is inspected several times for topmouth gudgeon before it can be returned to the water. Unfortunately some native species like roach cannot be put through this process as they would not survive, so we will humanely cull them along with the top mouth gudgeon. Will it harm other animals? Rotenone is selective to fish, which is why it is used. Mammals and birds are not affected. Animals that eat it, either directly or through eating animals that have been exposed, will not be affected because all animals have natural enzymes in the digestive system that break down rotenone. What will happen to the rotenone? Rotenone is a naturally occurring organic substance. It breaks down when exposed to light, heat and oxygen. When applied to water it will break down to carbon dioxide and water in a few weeks depending on conditions. In the case of the stream treatment, we will be neutralising the rotenone using potassium permanganate. Yes, we have used this method before to eradicate other populations of invasive fish, including topmouth gudgeon, sunbleak, wels catfish, pumpkinseed and fathead minnow. All our operations have been successful and the sites have now been restored to their former condition as productive, valuable, fisheries. Can another method be implemented? No – we have examined and tested all other options for management of topmouth gudgeon including: no action, screening outlets, rod & line removal, netting / electrofishing removal, egg removal using spawning mats, biological control (introducing other predatory species), drain down and liming. All of these options will only achieve management of the population and not eradication. Due to the threat posed by topmouth gudgeon it is essential that 100% eradication is achieved – piscicide application represents the only viable option to achieve this in this case. What will the EA do to prevent this happening again? We regulate every fish introduction and removal in the freshwater environment through fish movement consents and ILFA licenses. We educate anglers, clubs, land owners and fish farm owners about the risks posed by non-native species and importance of managing their activities carefully. We make clear that there is a ‘buyer beware' responsibility on the buyer of any fish. We work with Cefas and the fish farming industry to monitor fish movements. Like I say, I haven’t included everything that was in the PDF, just the bits that I thought were important. However, if you’re still not happy and want to know more, then send me your email below via the comments page (don’t worry, it won’t be visible to everyone) and I’ll email it to you. However, this wouldn’t be needed if news agencies were to publish full details instead of just going for the sensationalist approach. Even just supplying a link to the PDF would have helped. On a positive note, the EA were very helpful and quick to respond to my questions, something other agencies would be good to pick up on. We, the general public and businesses, especially those who impact on nature, need to learn and learn quickly that our actions, regardless of how insignificant WE think they are, can have devastating effects on our surroundings and beyond. As an ex-truck driver, I have delivered to out of the way, back of beyond warehouses in the middle of nowhere. All around their perimeters are rodent poisons which may be good at killing rodents, but they are also good at killing other wildlife such as owls, kestrels and other predators through secondary poisoning, eating an animal which has been poisoned by the rodenticide. No-one knows how Topmouth gudgeon got into the system. They could’ve been introduced by someone who stocked a private pond, or an unscrupulous fish dealer out to make a quick buck. They could’ve been a tank fish that someone had got tired of and decided to release them into their nearest waterway thinking the weather would kill them off. Many years ago, I once knew a person who released Koi into a stream because they were getting to big for his pond. I won’t repeat here what my response was to him then. Needless to say, I no longer know this person as I don’t suffer idiots well. Reports have been coming in from a couple of my readers of starlings in largish numbers. First report is from Mick who tells me that he saw a largish flock at the original site at Ransomes this week and that they were starting to murmurate when he saw them. Anne emailed me to say she spotted around 120 starlings at the nearby Trinity Showground feeding on land adjacent to Purdis Heath. I remember many years ago when I lived on a boat on the broads, I remember mooring up one evening and seeing a murmuration in the distance which I watched for ages. As I did so, every now and then a small flock of starlings would fly past or overhead, heading in the direction of the murmuration. A sure sign that these displays pull in much smaller groups for quite some miles around, safety in numbers! So thanks to my roving reporters, I will be out in the next few days to see what murmurations I can find. In case you haven’t done so already, you can still vote for my Barn Owl Hunting mobile device picture in the Suffolk Wildlife Photo Competition here. Voting closes soon so no time like the present. Till then dear reader, take care. About zoonoses - fascinating. How and why viruses (sometimes bacteria) jump species and sometimes to humans. How the changes humans make to ecosystems upsets balances that have been stable for millennia. Brilliant book. Something to do in your spare time ! !